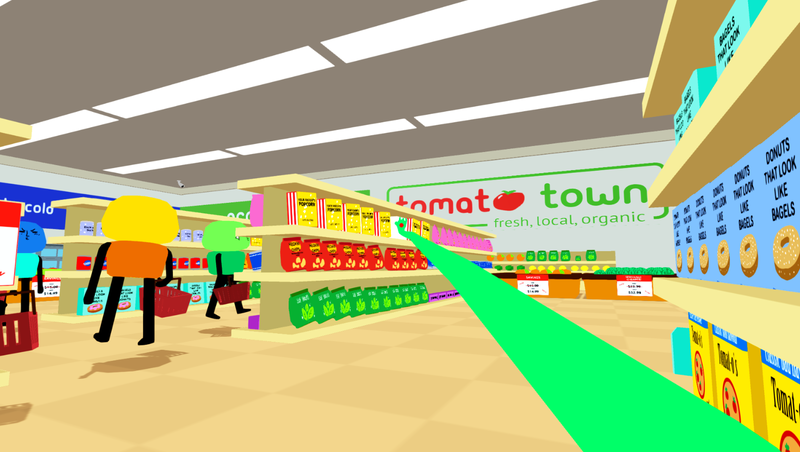 "Welcome to Tomato Town - your one stop shop for all your grocery needs!" "I'll Take You To Tomato Town" is probably a grocery store simulator. 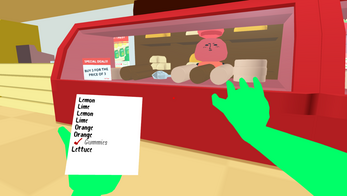 Check items off your list as you scour Tomato Town for the food you need. Created for the Ludum Dare 40 within three days. youve gotta download it. fun, wacky and a whole lotta laughs. cheers to the creators. Check out my experience! COOL GAME KEEP IT UP ! What a hilarious game. It's short, but wacky and fun! I played four rounds in a row. Going to play more. Gonna link to a friend so she knows what to expect when we finally move in together and she goes grocery shopping. Check me out trying this game! The lettuce man !! the lettuce is weird !! and apparently I don't know what it loos like ! Had a lot of fun with this one. I'm a sucker for creative game-jam titles that own some sort of wacky mechanic and this one did it for me. Great sense of humor - I even loved how the devs couldn't even deliver some of the lines without laughing. The NPCs have anime-like faces which just adds to the zany nature. overall, download this game and follow the devs to watch for what they might have in store next. this is a GREAT game and I would really reccomend it to pretty much everyone and I really would love to see more games like this! I played this game for my channel, this game is 10/10 in my opinion. It looks and is great. Such an awesome game! Everything about wasn't what I was expecting! I am also glad my trashy computer can even run this game! WOW! It's weird, but weird in a good way. especially after getting all the groceries you need ^~^ I would like to see more games just like this one! Thank you so much! Keep up the good work! I had a great time playing this and can't believe it was put together in three days! My favourite item was the Heckin Chips. Here's my game play, I managed to get away with $1000 in loot! This was certainly a strange game in concept, but that did not stop me from having a really fun time playing it! The flubber hand grabbing everything and the funny labels on all the products for some reason just worked for me. 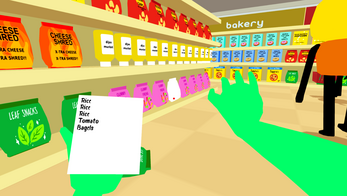 If you want to play something different with lots of jokes and silliness hidden throughout you should try this game. If you want to see me try and fail a few times you can watch my letsplay below. Thanx for made this aweasome game, but is there will be an update?